When diving after fish, Ospreys can completely submerge themselves underwater and still be able to fly away with their prey. Most other fish-eating birds of prey can only pluck fish from the surface of the water as they fly by. 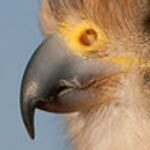 When they dive into the water, Osprey close their third eyelid – called a nictitating membrane – which is semi-transparent. It acts like goggles and helps them see clearly beneath the water. When Osprey carry their prey, they always reposition the fish so that its head faces forward in a streamlined position for transporting through the air. The Peregrine Fund has been studying fish eagles in Kenya, Madagascar, and other countries around the world for decades. We have not worked directly with Osprey, but conserving habitat for fish eagles automatically conserves Osprey habitat as well! 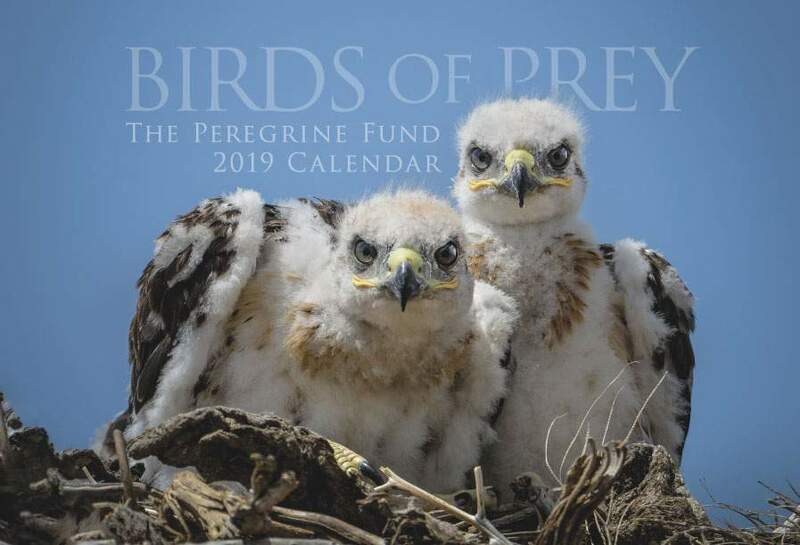 Our efforts in these regions also include providing environmental education, training students as biologists, and spreading the word about the importance of birds of prey by publishing articles in magazines and newspapers. All of this will help protect Ospreys, as well as a host of other wildlife species in the regions where we work. No matter where you live in the world, chances are you live near an Osprey. Similar to the Peregrine Falcon, Ospreys are found on every continent of the world except Antarctica. They live in both temperate and tropical climates, but they do have some specific habitat requirements. Because they are principally fish eaters, they like to remain close to still or slow-moving body of water. After all, no one wants to be away from a reliable food source for too long! Ospreys can be found near oceans, rivers, lakes, mangroves, coastal wetlands, lagoons, reefs, estuaries and marshes. If you find yourself near a body of water, pay close attention. 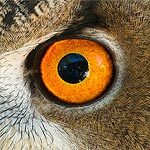 You may see an Osprey hovering in the air in search of prey, making a complete dive into the water, or conspicuously perched on a telephone pole or other high perch. When the weather turns cold enough to freeze over rivers and lakes, there is little for an Osprey to feed on. So, populations living in the far north migrate long distances in the winter, traveling as far south as Central America, South America, and northern Africa. Osprey are fish-hunters, and they have many unique adaptations to make them very good at what they do. Unlike other fish-eating birds of prey, Osprey can dive feet-first all the way into the water, getting soaked from head to talon, and still fly away with their meal. If you watch closely, you will often see them shaking the excess water from their feathers in mid-air, just like a wet dog does on the ground. When Osprey are underwater, they can close their nares, or nostrils, to prevent water from flowing in. If you have ever had water up your nose, you know how uncomfortable that can be. This is an important adaptation for a species that makes its living diving underwater. If you look at an Ospreys' foot, you will see a few other interesting and important adaptations that help this fish-eating raptor catch its prey. The bottom of the bird's foot appears as though it could use some lotion, but what you are seeing are backward-facing barbs. These barbs make the Osprey's feet extra rough, which they need to be to hold on to a slippery fish. Another thing to notice is that two of the Osprey's toes face forward, while two face backward. They can change the position of their toes from this configuration to having three forward and one back. This, too, helps these birds get a better grip on prey. Anyone who has tried to hold a slippery fish knows how easy it would be to drop one! Life is hard for any predator. They must use a lot of energy when catching prey. If Osprey dropped many of the fish they caught, they would waste a lot of energy for nothing. These two adaptations help them hold on to their dinner as they fly to a secure perch to eat. 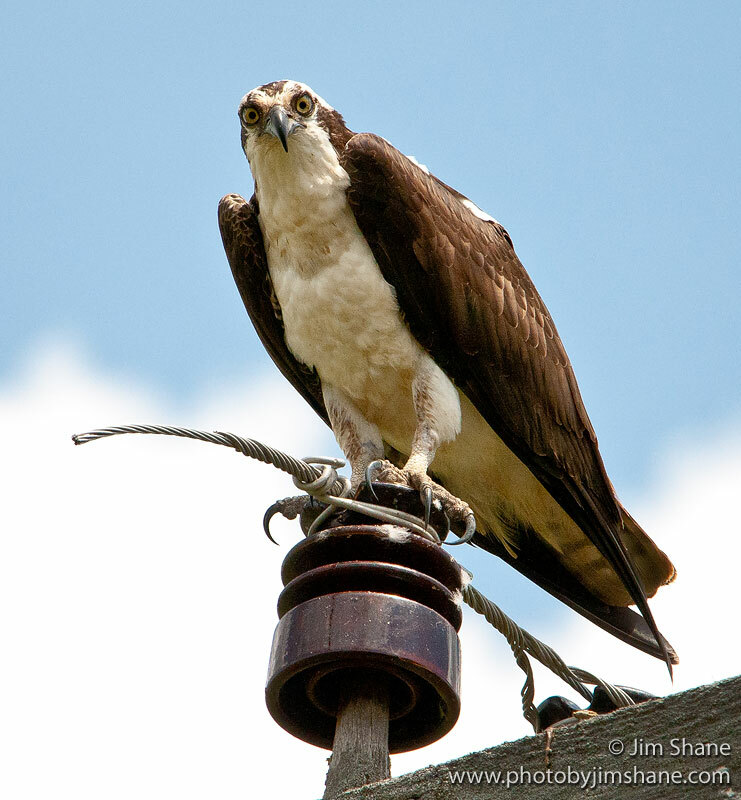 Like so many other species of wildlife in the 1950s and 1960s, Osprey populations suffered negative effects from the widespread use of the pesticide DDT. Today, their populations are doing much better and Osprey seem to be holding their own. However, there are still many risks these beautiful birds of prey must face in their daily lives. In some parts of the world, people shoot Osprey because they see them as competitors for the same food source. Contamination in rivers and lakes, loss of habitat, and even electrocution are some of the challenges facing Osprey in a modern world. 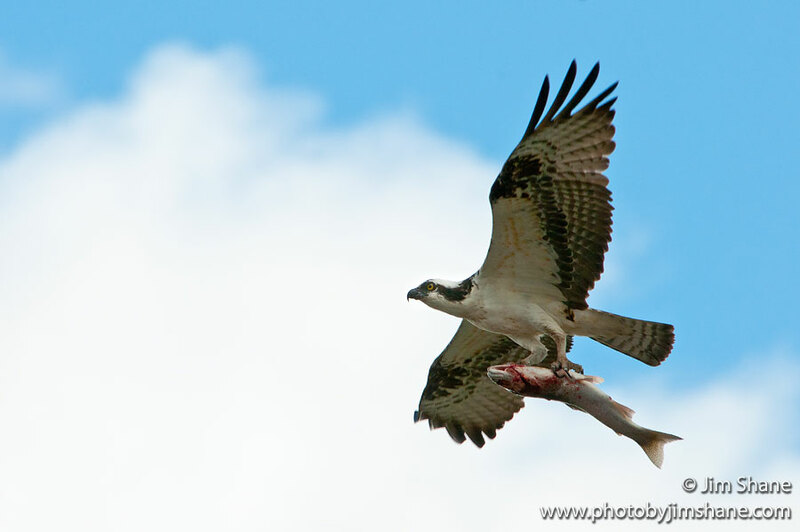 Though Ospreys mainly eat live fish of a wide variety of species, the types of prey they might catch are quite diverse. Snakes, birds, frogs, reptiles, mammals, crustaceans, and other invertebrates can all fall prey to the deft, sharp talons of an Osprey. When searching for their next meal, Ospreys usually fly low and slowly over the water, or even hover briefly over a spot that looks promising. All the while, their keen yellow eyes are on the lookout for movement just beneath the surface of the water. If they don't spot a fish that way, they may resort to more clever tactics. 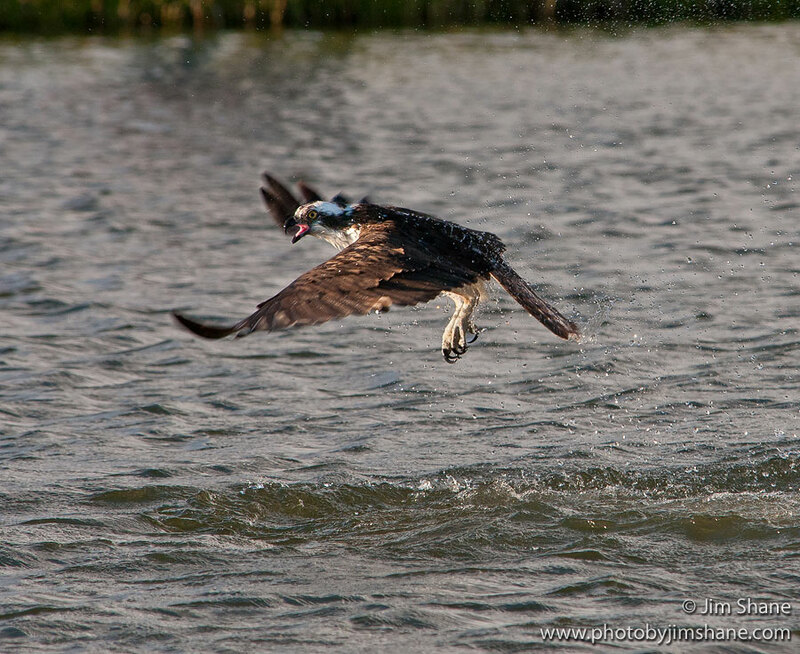 Osprey have been seen flying right above the surface of the water with their legs hanging down and their feet occasionally dragging in the water. As you can imagine, this could startle an unsuspecting fish, which may then move or jump. When a fish is spotted, Ospreys make dramatic, graceful dives from heights of 30-120 feet and plunge feet first into the water to capture their prey. With a fish safely in tow, they normally fly to a tall perch where they can eat their meal in peace. 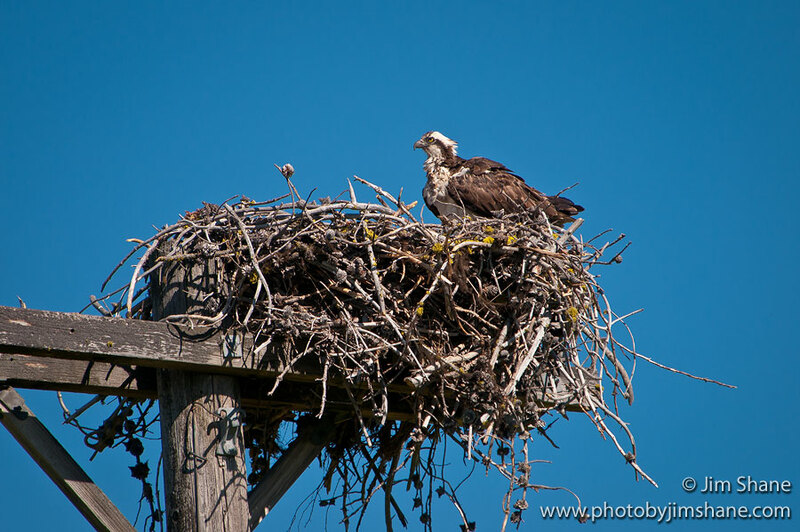 Though Osprey generally nest in high places, such as trees, power poles, or cliffs, they have been known to nest on rocky promontories, offshore stacks of rocks, or even on the ground. 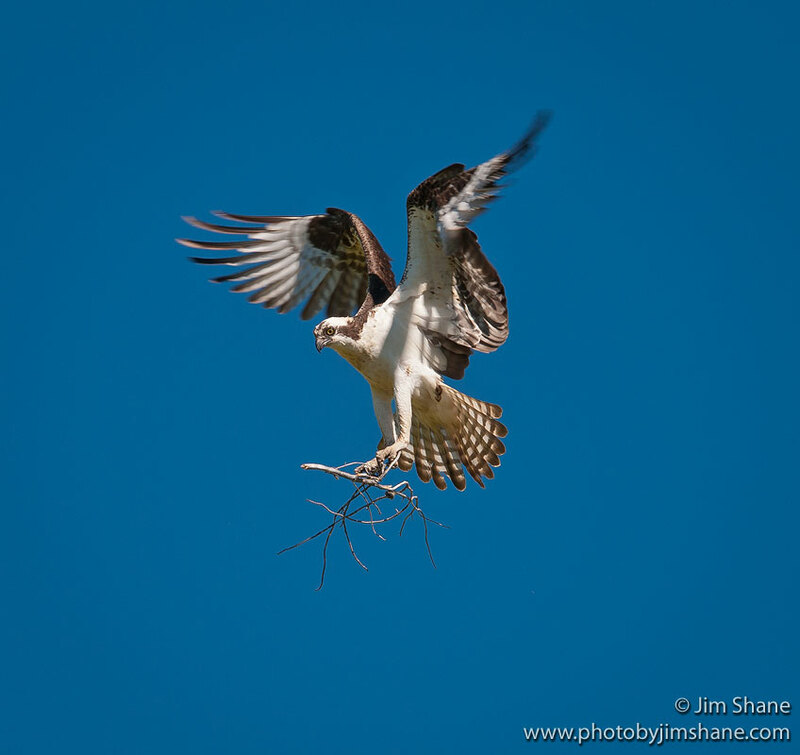 When it comes to building nests, few birds of prey can keep up with an Osprey. They build some of the largest nests and use some of the most interesting materials. Though they start off with the basics – large sticks piled together to create a strong foundation – they line the nests with seaweed, bark, leaves, grass, or any other materials they can find, from fishing nets to plastic bottles. Osprey re-use the same nest from year to year. Every season, both the adult male and female add new material to the nest. As you can imagine, over time, some nest structures reach enormous sizes! The female usually lays 2-4 eggs, which are white with bold reddish-brown and dark brown spots and blotches. Both the male and female work hard to care for their young. The female incubates the eggs and then feeds the chicks after they hatch, while the male's job is to bring fish to feed his family when the chicks are small. After the young fledge, they stay with their parents for two or three more months while they learn how to survive on their own. Come to Idaho and see Osprey! Though they are not seen often around the World Center for Birds of Prey, they can certainly be seen not too far away. 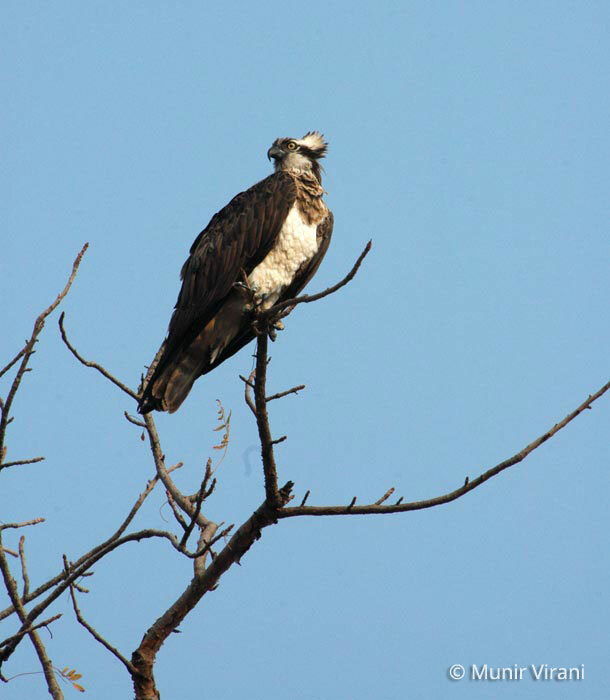 Osprey are found throughout the state and can be seen nesting on large platforms in many areas. They are occasionally spotted perched in large trees growing along the Boise River or soaring near Lucky Peak Reservoir and along the Snake River, among many other places. The World Center for Birds of Prey offers fun ways to learn about birds of prey. The visitor center offers interactive displays, tours, interesting videos and a children's room with activities from coloring sheets to quizzes to costumes and a touch table for the curious mind. We also have several different birds of prey on display year-around. Knowledgeable staff and volunteers are on hand to answer any questions you may have about Osprey or any other birds of prey.